Jennifer: I am a 31-year-old mom of two trying to become a successful entrepreneur in an extremely niche industry. I currently live in Utah with my family along with six chickens, two ducks, one turkey, a dog and a cat. I have bigger dreams than I can keep up, with but I will keep chasing and catching as many as I can along the way. How did you get involved with performing arts on the acrobatic side? To be honest, I was never a great athlete although I tried out for most sports growing up. I was always uncoordinated and definitely not flexible, so I thought I would just be a strong athlete. It turns out the body needs more than just strength through the muscular system. I always did my best and worked my hardest, but I just never developed into the athlete I thought I could be. I went to the U of U after I graduated high school and tried my hand at academics. School learning is not my strong suit either. Long story short, I ended up on the opposite end of progression and put myself through a very dark time which in the end turned out to be the exact push I needed to find the light again. What drove you more toward aerial performances and made you want to try it? I am mostly self-taught, and in the beginning it was more for the challenge and the boost in ego to "show off." Every gasp from the audience and awe-stricken expression on their face was enough to make me crave more. 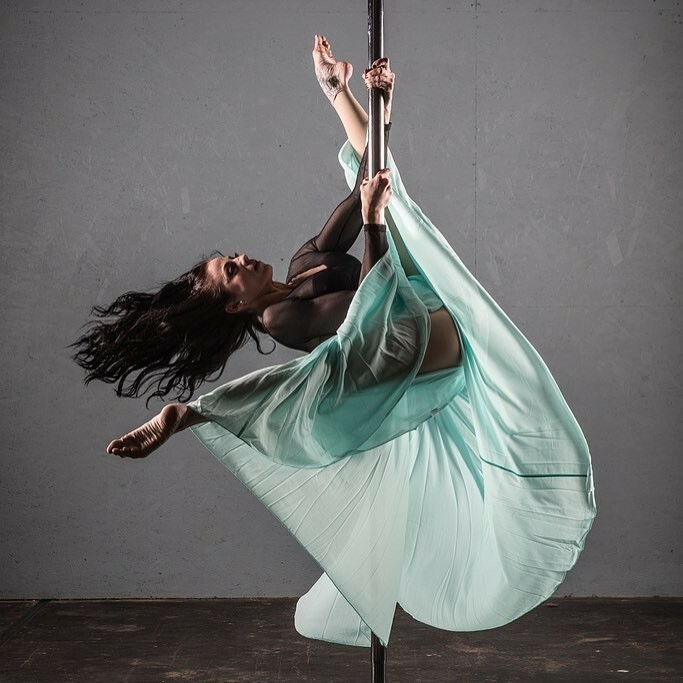 Turned out I was really strong, so I could do some pretty incredible things, but it wasn't until I competed in Utah's first ever pole dancing competition that I realized how little I knew even after four years of training. I had seen so many things that sparked a hunger for learning, and from then on I was hooked on learning as much as I could about calisthenic training and the functionality of the human body through strength and flexibility. What was it like for you learning the skills and developing your own style? I have had a lot of fails while learning and developing my own style. I have had many injuries; most were due to my lack of knowledge in functional training while training at a high level of acrobatics. I couldn't afford to take classes and, to be honest, I feel very much like a misfit. I have had many setbacks, including two pregnancies, but all have taught me incredible priceless lessons that I could have never learned in a classroom. Something amazing happens when the body forces us to slow down, rest and restore. How did you enjoy performing around Utah and building an audience for these performances? Performing is one of my favorite things, but it definitely depends on the crowd and the atmosphere. I have never had a good experience performing at a bar, and I am extremely particular about the venues and events we will work. We deliver quality and professionalism, so we expect the same of our audience and venue. Because of this, we have had nothing but incredibly memorable events that keep us inspired and excited for future jobs. I read that you developed a couple of your own styles and techniques. What are those styles, and how was it creating them in such a unique environment? Through my years of teaching, I have used my students' feedback as my biggest tool for evolution. Every complaint, pain or discomfort was taken into serious consideration. I found my students would talk more about the bruising they experienced from the pressure of their bodies against the apparatus than the soreness of the muscle. This to me was not okay. I wanted them to see the incredible abilities they would soon have if they trained functionally. The JW Method program was designed to build foundational muscle, which I learned was the least worked muscle in the athletic world. The muscles needed for slow controlled movement are often neglected, resulting in a higher risk of injury during athletic activity, and will immediately halt your progress until they have been built. JW Method has since been recognized by several physical therapists as an incredible program to continue once a client has been cleared from physical therapy. It has proven itself time and time again as our students see incredible results in stability, strength and coordination. It has influenced all of our programs, including our beginner aerial arts programs. 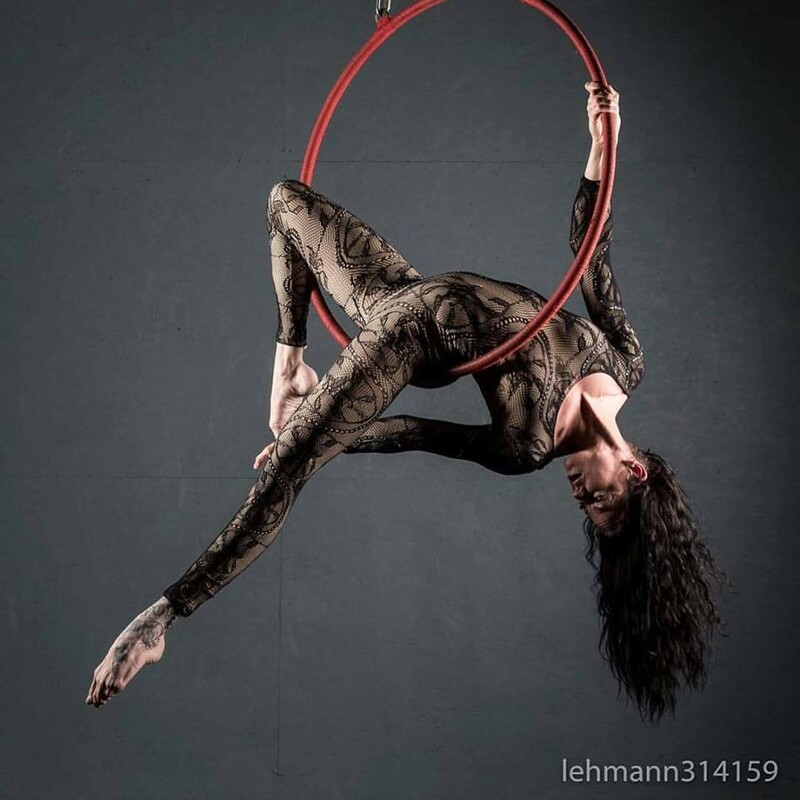 We use systematic training to allow the body to adapt to the stresses needed to perform aerial arts and contortion. What made you decide to open Cirque Asylum? I have always wanted to be able to say I had my own business. At the age of 19 was when I found my first business partner. Cirque Asylum is the product of 13 years of evolution, and the vision I had when I was 19 does not compare to the giant that is Cirque Asylum now. It's a safe haven for anyone that has ever felt like they didn't fit. Through CA, I want to provide a place of healing for mind body and soul, as well as provide the opportunity for artists similar to myself that are looking for a career path doing what they love. How did you eventually find the location in Sandy? How was it transforming it into the kind of space you needed to teach? Over 13 years of trying to make this business work, I have had more than nine different studios. I have had three studios in the building I am currently in, and every room I moved into was in need of a complete makeover. The first studio I found was a small room in the very back with a flickering light above the door. It was my very last attempt at success. I was already planning on what I would do when it failed as it had so many times before. Something happens to you when you think about your life without your passion: You either slip into a deep dark depression, or you fight until you are curled up bloody and crying, still fighting to find a way. I chose the second way after another huge catastrophe that would have made anyone else quit. I moved into a bigger studio having to remodel again, but as a trade to my landlord, so if I failed at least he would have a nicer room. His faith in me is the only reason I am now a success. Our most recent expansion was one of the biggest risks I have ever taken in my career, and it turns out sometimes you win. It did not come without blood sweat and tears, but that is why Cirque Asylum is what it is. How did you go about finding the instructors you wanted to hold classes? Finding instructors locally in such a niche industry, with all the expectations that I have, is nearly impossible. I have found the best way for me to find instructors is to raise them. Most of Cirque Asylum's instructors started as students. When I feel they have a strong understanding of their own training, I offer them continued education starting with The JW Method certification, which is a 110 hours of learning plus 100 hours of student teaching to complete the training. This is the foundation of a strong teacher and sets them up for understanding how to break down complex moves into systematic training. Once their certification is complete, they complete 100 hours of training in each apparatus they choose to instruct through apprenticeship and personal training from myself. For those who haven't been, what's it like starting out and learning the techniques? For those who haven't been, our schedule and techniques can be a bit overwhelming at first. We are very detail-oriented, and the body's alignment while performing exercise is our first priority. Acrobatic tricks are the reward you receive for the hard work and dedication of your foundational training. Because of our attention to detail, it makes learning extremely easy for our students and far less intimidating. We believe in getting to know our students and keeping classes small so we may continue to deliver results in a safe and efficient manner. Do you recommend people start with one and master it, or try a little of everything to see what they like? My biggest recommendation is balance. Start slowly with flexibility, flow arts and foundational strength (JW Method). After a few weeks of building, start slowly adding in one apparatus per week. All of the apparatus have different grips and similar but different muscular movements, so it is important not to stick with just one, although it is entirely up to your interests. If the body only moves in similar patterns and never changes it will adapt causing your progression to slow and will begin to stress tissues that are being neglected. Do you have any performances coming up during the spring and summer for people to check out? We have our Spring WildCard Student and Instructor Showcase May 26 at the AISU Theatre (4998 So. 360 W.) in Murray. We will have a preshow featuring our fire performers at 6 p.m. and our aerial artists, flow artists and belly dancers will be starting at 7 p.m. More information can be found at our website. We will also be holding our first production of our own style of Alice in Wonderland at the end of June. Stay tuned for more information on our site. Are you looking to expand down the road or are you happy with the studio how it is? I am far from where I want to be, and have big plans for Cirque Asylum's future.